My husband and I have been married for 16 years. It hasn’t been easy. We didn’t go into our marriage with a Christ-Centered marriage in mind. Neither one of us were walking with the Lord when we got married. 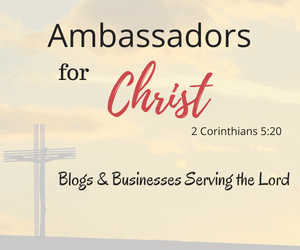 My husband was a backslidden Christian and I never had a personal relationship with Christ. It’s amazing to look back and see that God had a plan. We didn’t know it at the time but He was drawing us to Him. We’ve been walking with the Lord for the past 10 years and our marriage has never been better. It’s only because we have a Christ-Centered marriage that we’ve made it this far. I’ve learned so many things as I’ve been growing in Christ and have so much more to learn. Like most people, I didn’t walk into my marriage thinking about the future. I was “in love” and that’s all I thought about. It brings me to tears the more I think about it. It could have been such a mess if God didn’t rescue us. We have many more years to go in our marriage but I want to share with you what I’ve learned so far. 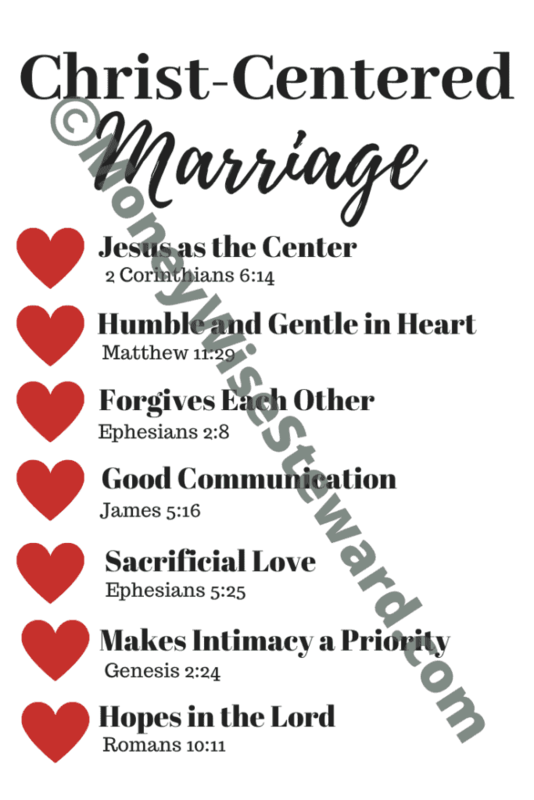 Hopefully, these things will help you with your Christ-Centered marriage. Our ultimate goal should be to glorify God through our marriages. After all, He’s the creator of marriage. It’s really important to examine your marriage and see what the purpose is. You can get married, serve each other but it’s only Christ-Centered if Jesus is the center of it. Both husband and wife need to grow together in their walk with Christ (2 Corinthians 6:14). You should be holding each other accountable to Christ. Your purpose should be to serve Christ in your marriage. Christ tells us that He is gentle and humble in heart (Matthew 11:29). Instead of being self-involved, you need to be looking for opportunities to serve your spouse. This is a hard one because when I’m upset with my husband, the first thing that crosses my mind is that I don’t want to serve him. It’s a battle but ultimately, I want to be obedient to Christ so I end up serving him. Sometimes, I have to go out of my way to find ways to serve my husband. It’s definitely something you can overlook easily. You need to be intentional. In a marriage, you are both sinners saved by grace (Ephesians 2:8). Our flesh is still capable of bad attitudes, mean words, dirty looks and more. If you allow a disagreement to continue, you are opening a door to spiritual warfare. It will continue to fester and break down your marriage. As Christians, we are called to fellowship (James 5:16). Communication involves speaking and listening to one another. My husband and I are very different. I talk way more than him so sometimes it takes some effort on my part to be patient and not get frustrated when I’m trying to communicate with him. Thankfully, we are usually on the same page with Christ as our center. Jesus is the greatest example of sacrificial love by dying for us (Ephesians 5:25). We need to “die to self” in our marriage. We need to live selflessly. We need to focus on what’s best for our spouse. I have a tendency of thinking about myself without realizing it. I try really hard to put my husband’s needs before mine. There are different aspects of intimacy. God created a special type of intimacy for marriage alone (Genesis 2:24). We need intimacy in our marriage to help us grow together. There’s a special bond that takes place between a husband and wife. When my kids were young, I neglected my husband because I was so caught up in raising my kids. We were definitely off balance and I’m thankful the Lord woke me up in this area. This world can really grab our attention. We can find ourselves focusing everything on our kids, homes, cars, careers….you name it! We need to keep our focus on the Lord and His promises. Things can and will disappoint us in life. Together husband and wife need to treasure their hope in Christ more than all the temporal things in this world. He will never disappoint us (Romans 10:11). One thing that I have to constantly remind myself is that I am called to walk in obedience to Christ (2 John 1:6). There were times when I felt like my marriage was in a bad place. The only one who could fix it was Christ. When I surrendered and gave it to Christ, He always came through. It’s the trials we endure that make us stronger and rely on Christ (James 1:2). Being a Biblical wife is an ongoing goal for me. Showing your husband that you love him is such an important part of that. Don’t let anyone give you the impression that they have the perfect marriage. No marriage is perfect. It can only come close with Christ as the center because He is perfect. This is something people need to hear. I have many friends who went into marriage and didn’t count the cost. We can’t be selfish in marriage, we need to embody and cling to Christ! I love your tips. God bless you. I agree. People need to know these things before marriage. It’s a big commitment. #1 and #7 are super important! Without Jesus at the center there can be no true success in a marriage! Absolutely! My marriage would be in ruins without Christ. When Christ is the focal point of our hearts, our marriage and every other area of life become Christ-centered. Thanks for being honest and for the reminder to die to self. Yes, Christ needs to be our center. Dying to self is the hardest part. Very true! Thank you for writing this post! With Christ in the center, you will not be broken! Thanks for stopping by! Christ is definitely the “rock” for every situation. I don’t know how I’d get through life without Him. Thanks for sharing! I don’t think anyone walks into marriage really understanding just how much it takes. Yet God uses it to refine us and draw us closer to him as we learn to love one another better and better. I agree. I do feel like I can prepare my children but they won’t fully understand it until they experience it. I have been married for 25 years. I think these are spot on. You cannot have a great marriage without Christ in the middle. The focus has got to be Jesus, not yourself. And, yes, intimacy is really important. It is the thermometer for the relationship. If you are not intimate regularly, something is off in another place. Always refreshing to hear a solid article on marriage that doesn’t sugar coat the deeper issues!